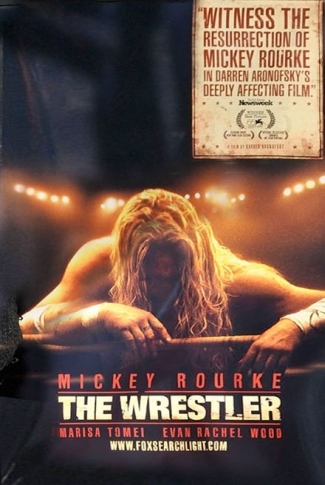 Just got done watching this critically-acclaimed film starring Mickey Rourke and Marisa Tomei. It was . . . well . . . interesting. Not that I'd ever have to watch it again. Trying to be positive here, but it's hard not having much of a basis in professional wrestling "culture." In fact, if ye socks simply listen to the *new* Bruce Springsteen song composed specifically to play behind the closing credits, you can pretty much get the gist of the movie without having to waste an hour and a half of your lives. The Wrestler is a one trick pony. He's not a good dad. He's not a good boyfriend. He's not a good employee or co-worker. He's not good at anything beyond the wrestling ring. And, that's frustrating . . . at least to this viewer. I kept getting disappointed with Rourke's character. Just when you think he's ready to accept a new phase in his life, one in which he might gain some real self-actualization, he reverts to form. I guess it was all that disappointment that overshadowed the few glimmering aspects of the film. Bottom line: skip the flick, stick to the soundtrack. So, he was off by a coupla days . . .